The wisdom teeth, known as eights, are called like that because they grow later in life, after all other teeth and can often cause unpleasant pain during their growth, sometimes not emerging fully or deteriorating as they grow - all these are the reasons for their removal with surgery. They may endanger the surrounding teeth, but also the whole jaw, the reason is that often the wisdom tooth is growing wrong. One of the most common problems is, however, almost unbearable pain in the jaw, which in most cases occurs during the growth of wisdom teeth, which is in most cases spreads to the rest of the jaw, ear, temporal region and throat. Due to all the mentioned activities, some dentists recommend preventive removal of wisdom teeth. However, if the tooth wisdom teeth is healthy and in proper position, it should not be removed, because it can later serve as a carrier of the dental bridge structure in case of need. Wisdom teeth are contiguous teeth that do not participate in jaw contact, and have a function in preserving the jaw bone, if they are in the right position and if there is adequate space for the emergence and proper placement in the dental arch they prevent loss of bone at the ends of the jaw. Unfortunately, wisdom teeth often cause disturbances during their growth, because it is accompanied by pain. The pain of wisdom teeth can be quite strong and persistent as it expands toward the ear, temporal area or neck, depending on which jaw it grows on. These are the teeth with frequent anomalies in position, and during their growth they can endanger the surrounding tooth structure, or other molars because it can put pressure on the roots and cause additional pain. That is why dentists have a difficult time to localise the pain, because patients report that it hurts in the entire jaw where the tooth wisdom is growing. Sometimes an inflammation of the gums around wisdom teeth occurs, which further complicates any intervention, and the extraction of wisdom teeth under inflammation is not possible because it must first be rehabilitated. If the problem with wisdom teeth is not visible and patient still feels a strong pain, diagnostic is easily established with X-ray, where you can immediately see how wisdom teeth grows and what remains to be done. When is the extraction of wisdom teeth recommended? Many dentists advise extraction of wisdom teeth with surgery, and for each case only when necessary. Since the growth of wisdom teeth can push the whole arch and move other teeth many dentists have only one choice and that is the extraction of wisdom teeth. However, there is more classification of position of the teeth, depending on how they are positioned on the lower jaw. Surgical intervention and extraction of eights is necessary in terms of impacted third molars. These are eights that have not fully emerged and are found in the bone. There is also the term ' half grown wisdom teeth”, which means that in the mouth you see only a small part of the tooth crown. They are also indicated for surgical extraction. When should we preserve wisdom teeth? There are many cases when wisdom teeth are preserved and treated because every healthy tooth is valuable. If you miss the first or second molar (six and seven), and you have a healthy wisdom tooth with intact biological value, it can be used for any prosthetic rehabilitation (making a metal-ceramic bridge). Therefore, it is necessary to save and preserve each tooth that has a meaningful function, including eights - wisdom teeth. Learn about dental bridges and dental implants. The fear of any type of surgery is very common among the population, so wisdom teeth are no exception. However, in this case, fear is not justified, because the extraction of wisdom teeth is an intervention that is often done in practice and complications are really kept to a minimum, except in cases of prolonged bleeding, when haematology of a patient needs to be prepared. The mere preparation for surgery is not complicated, nor is postoperative time. Those who are preparing for it should not eat immediately before the intervention, and that is required by dentists. Wisdom teeth surgery is performed under local anaesthesia and it is absolutely safe. 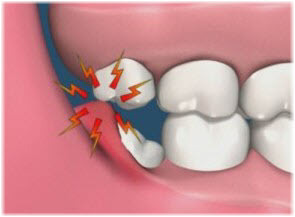 Extraction of impacted wisdom teeth is performed solely by specialists in oral surgery. With good medical history and preparation, extraction of wisdom teeth has become a routine intervention, which does not last long and is almost painless. After the intervention people can return to their normal activities two to three hours after the effects of anaesthesia, of course without exposure to strenuous physical efforts. In particular you should pay attention to mechanical injuries. For people who have longer and slightly thicker bleeding, the general recommendation is to contact their oral surgeon who performed the intervention and specialist haematologist. After the surgery of wisdom teeth it is essential that patients apply cool patches where the tooth was (cold packs). It is recommended that you avoid cold food and drinks in the next two days and eat soft food or pulpy food, because it is very important for the healing process. If necessary, use prescribed painkillers and antibiotics, and with the respect of these rules, intervention is generally comfortable for each patient. These are the last teeth that grow in the upper and lower jaw. The time of growth is subject to variations, usually after sixteenth year of age, but cases where wisdom teeth grow in later years are common. It also happens that some people have eights that are not visible, which can be seen on the X-ray of the jaw. What to do if a wisdom tooth causes pain? If the wisdom tooth is growing and causes severe pain most often in the evening, you should take a standard painkiller (a caffeine, ibuprofen, Nimulid) and as soon as possible contact the dentist. It is important to note that regular check-ups are the only real cure for all ailments and possibly prevent possible complications, when the extraction of wisdom teeth is surgically necessary.